There were many voices heard at Saturday’s March for Our Lives rally in Washington DC but there is one that stood out. Naomi Wadler took the stage and spoke of how black girls have been largely ignored in the gun violence conversation. “I am here today to acknowledge and represent the African American girls whose stories don’t make the front page of every national newspaper, whose stories don’t lead the evening news,” Naomi, 11, said as the crowd cheered. On March 14, the young leader was a driving force behind a walkout at her elementary school as part of the national effort to draw attention to the gun violence plaguing US schools. While students in most schools stood outside for 17 minutes, one minute for each victim at the Parkland school massacre, her and her peers stayed outside for 18. Wadler said they added the extra minute for Courtlin Arrington, a black student who was murdered in an Alabama school shooting after the attack in Parkland. “I represent the African American women who are victims of gun violence, who are simply statistics instead of vibrant, beautiful girls that fill a potential,” she stated. “For far too long these names, these black girls and women have been just numbers. I’m here to say ‘never again’ for those girls, too. Many conservative talking points that have claimed the children asking for gun control and taking part in the March for Our Lives are being manipulated by Democrats, their parents and even the FBI. “My friends and I might still be 11 and we might still be in elementary school, but we know. We know life isn’t equal for everyone and we know what is right and wrong. Her speech has inspired many, including some important voices in the black community. California Senator Kamala Harris reposted Wadler’s speech on Twitter drawing many responses of support and admiration. Actress and activist Amanda Seales was also clearly moved by the impressive speech posting it on Instagram with the comment “YES QUEEN”. Many celebrities came out to march in solidarity with students during the March for Our Lives. Kanye West brought his family to the rally. George and Amal Clooney, Halsey, Jimmy Fallon, Cher and many others were in attendance. Performers included Jennifer Hudson, whose own family was directly impacted by gun violence, Common, Andra Day, Ben Platt, Vic Mensa, Ariana Grande, Lin-Manuel Miranda, Miley Cyrus and Demi Lovato. 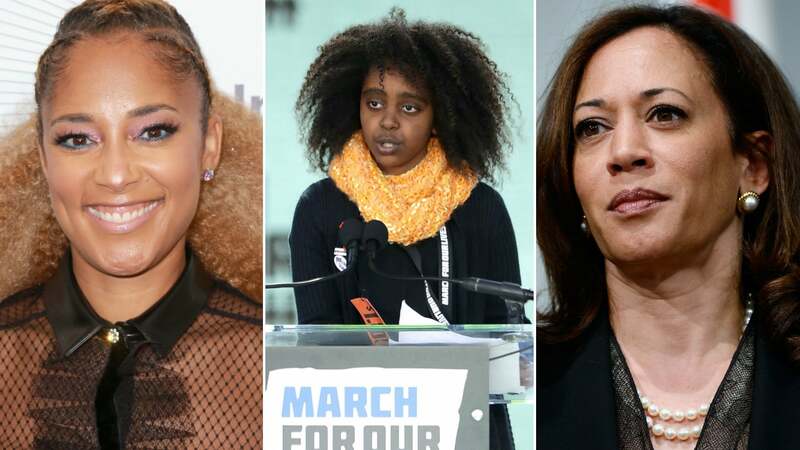 The March for Our Lives rally in Los Angeles was attended by celebrities such as Yara Shahidi, Ta’Rhonda Jones, Jacob Sartorius, Trevor Hall, Skai Jackson and many others. Amy Schumer who has been vocal about gun control since a shooting happened at a screening of her movie Trainwreck in Louisiana was there to show her support as well. The definition of #BlackGirlMagic, #NaomiWadler. Watching #HopeAndFury and thinking about #NaomiWadler’s speech today. I’m also reminded of the importance of the Black press. As Naomi so eloquently stated, our stories too often ignored/erased by mainstream press. "People have said I"m a tool for some adult. It's not true." Naomi Wadler "… I am here today to honor the words of Toni Morrison: 'If there is book you want to read but no one has written it, you must be the one to write it.'"